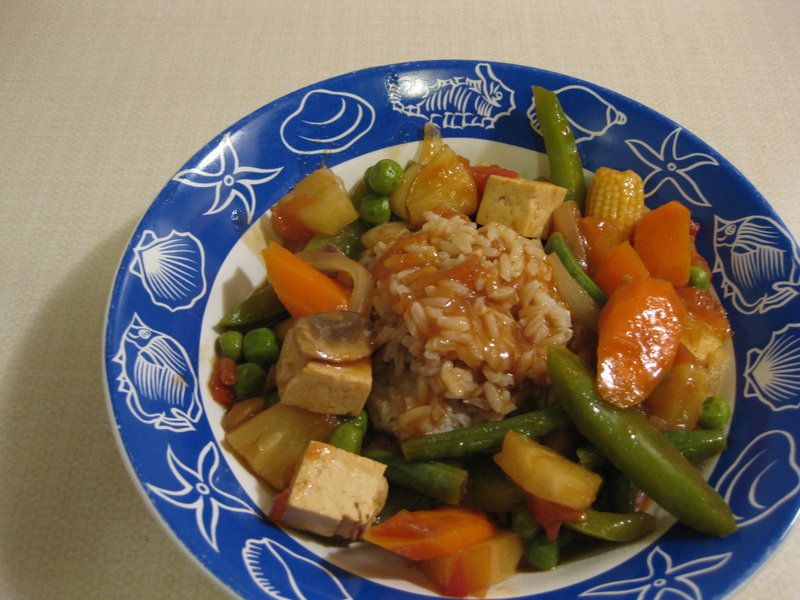 veganmofo 7: Sweet and Sour Tofu and Vegetables | Go Fork Go! This dish was originally inspired by the Thai Tofu and Veggies dish from Vegan Express. Upon closer inspection of the ingredients, it finally hit me that it was really a curried tofu dish and I didn’t feel like curried tofu. I’ve been in a sweet/salty mood lately rather than in a spicy, curry mood (thus the lack of Indian dishes). I tend to go in cycles. I will spend a couple of weeks cooking mostly asian, then a couple of weeks grilling and baking everything. Then a couple of weeks making Indian food. Then a couple of weeks not wanting to make anything and eating pasta and jarred sauce with random veggies. Rinse and repeat. Right now, I’m (obviously) in the middle of an Asian food thing. Back to the recipe. I didn’t feel like a curry dish. So instead, I recalled a sweet and sour pineapple dish my mom used to make which relied on… ketchup. Yeah, weird. My dish wasn’t quite as ketchup-y and was more of a stir-fry so I didn’t want such a heavy ketchup taste since that kind of a taste tends to wear thing pretty quickly. Keep in mind that the amount and types of tofu and veggies are pretty interchangeable. As you can see, I like to throw pretty much any vegetable that fits the theme into my dish. Heat olive oil in a pan. Add onions and saute for 2 minutes. Add carrots and green peppers and saute for 2 minutes. Add tofu and cook for another 3 to 5 minutes, until tofu begins to brown. Add tomatoes and white mushrooms, cook for another 2-3 minutes, until tomatoes start to look cooked. Add the remaining vegetables and fruit (baby corn, green beans, peas, pineapple) and ketchup, teriyaki sauce and soy sauce. Add water to thin out sauce. While the dish cooks, add water to the corn starch until the corn starch can fully dissolve in the water. When the sauce in the pan begins to boil, add the corn starch mixture slowly while mixing, until the sauce reaches the desired consistency. Remove from heat and serve with rice or noodles. Sounds delicious! The sweet-sour-savory combo is always a good one. 🙂 Thanks for sharing.